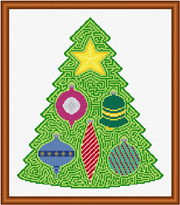 Ornaments that may be connected in a maze are shown. A glass or plexiglass cover and dry erase markers can be used to solve the maze, and then erased. A solution is provided. Colors may be changed.